Today let me share the recipe of the most popular dish in Indian restaurants. 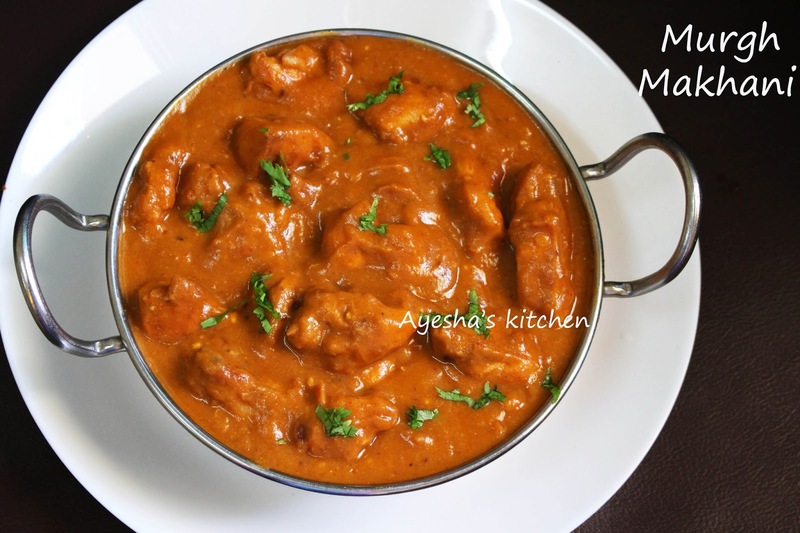 A very simple, delicious, authentic, restaurant-style butter chicken or murgh makhani recipe. Yet don't know the reason, maybe its name or its delicious flavour; butter chicken has managed to find its way around the globe. This buttery, rich, creamy dish does not need any introduction. Indian restaurants in UK, US, Middle Eastern countries have this butter chicken recipe showing up on their menu cards and already claimed its fame all over the world. As a North Indian dish, it made its place in every corner of the world and this rich yummy dish deserves it. 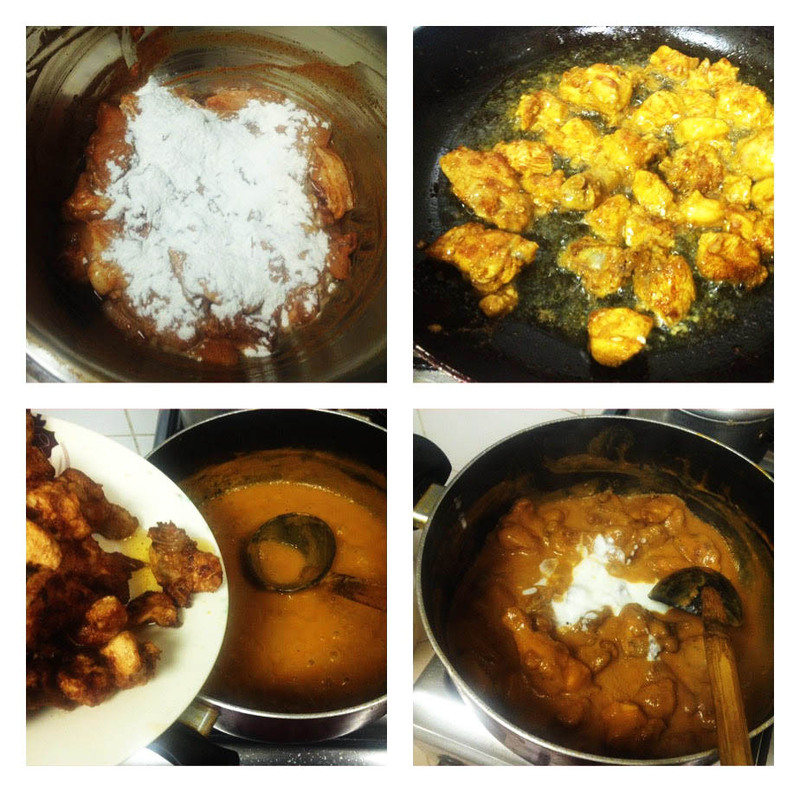 And let me say one thing, Chicken tikka masala, and butter chicken is quite different in taste and preparation. But still, some people say both looks same. Lets back to the recipe. 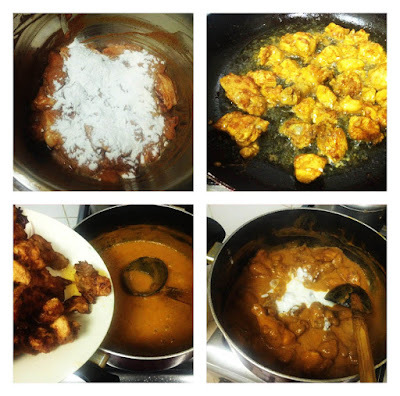 I had already posted a butter chicken recipe on my blog. recipe here..But both are different in taste. Here am sharing with you how to make restaurant style instant butter chicken with basic butter masala gravy. You can prepare this basic butter masala gravy in advance and keep refrigerated and can use for any veg and non-veg dishes like butter chicken, paneer butter masala, gobi makhani, veg makhani and like so. Hope this recipe will be a great help for you. Please try out this recipe and do let me know your valuable feedback. Dried kashmir chili / red chili - 12 nos(less hot and red color giving dried chillies are more preferred( for mildly spiced food lovers). Others who love hot and spicy food can add accordingly. Marinate the chicken chunks with the above-given marinade and let it refrigerate for 1 hour. Heat a pressure cooker and add a quarter cup of melted butter. 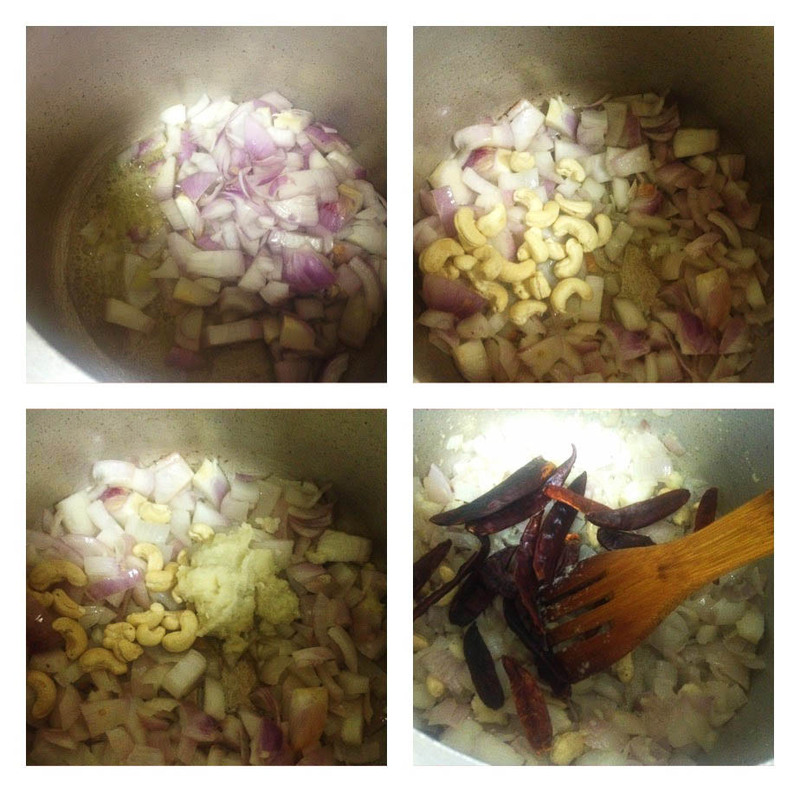 To this, add onions and cashew nuts. Saute for 5 minutes. Now add ginger-garlic paste and salt. Cook until the raw flavour is gone. When done, add color giving chilli (Kashmir dried red chilly) or dried red chilly, garam masala powder, tomatoes and mix well. No need of more sauteing. Put the lid on the pressure cooker and let it cook for 20 minutes on a low flame (5 whistles). No need of adding water. When done, let it cool down and strain out the water to a bowl. 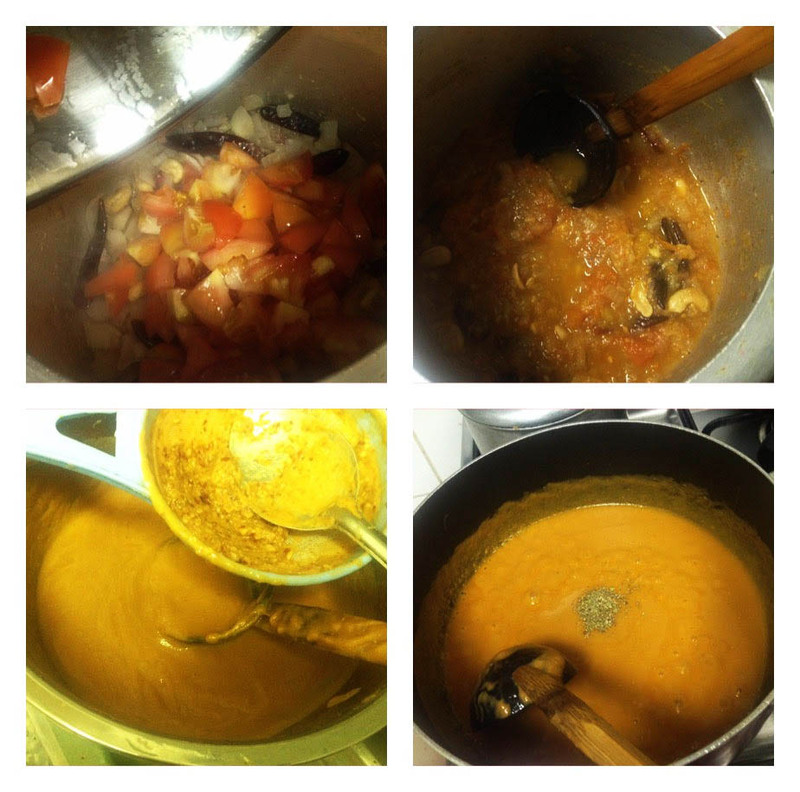 Then blend the cooked onion and tomato mixture to a fine paste. Again strain it into the same bowl we collected the water. Discard the seeds and peels of tomato after straining completely. Now cook this strained mixture for about 15 minutes on a low flame, stirring occasionally. When done, add salt, sugar and crushed Kasuri methi. Mix well. Switch off the flame, once it comes to boil after adding these ingredients. Cool it and store in a small airtight container in a refrigerator. You can use this Makhani gravy or basic butter masala gravy in any veg or non-veg dishes. Heat butter in a pan and cook the marinated chicken pieces until tender. Do not fry the chicken until crispy. Now add the fried chicken to the prepared Makhani gravy or butter masala gravy and let it cook for 5 minutes on a medium flame. Now add the fresh cream and mix well. Cook for a minute and then switch off the flame. Garnish with chopped coriander leaves. 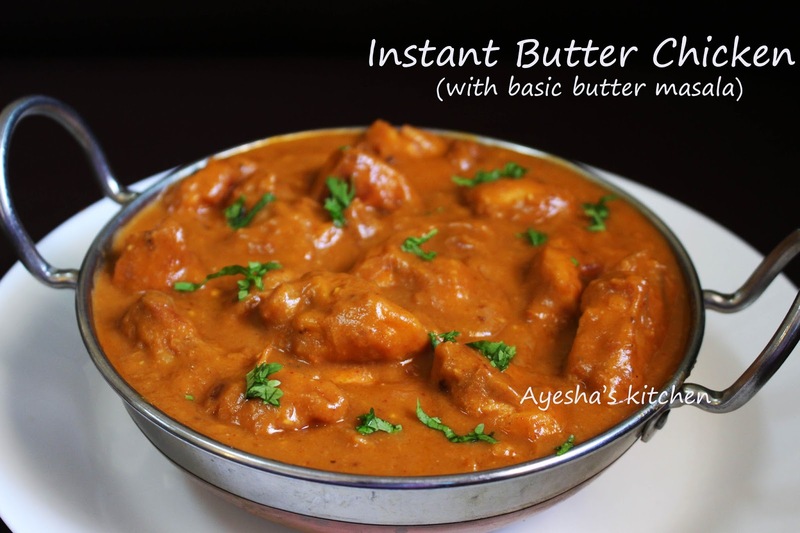 Delicious instant restaurant-style butter chicken ready. Serve along with paratha, chapati, butter nan, roti etc. Please SUBSCRIBE my youtube channel Ayeshas kitchen - click here.